Our wellness solutions are a health and wellness management solution providing members with tools and activities to adopt and sustain healthy behaviors to reduce health risks, improve quality of life, and enhance personal effectiveness. Through the SkyWell program, Skyway helped a client with 6,000+ employees avoid increase in health costs for over 4 years! SkyWell initiative at MetroHealth System earns its 3rd HBCO Gold Award. John Carroll University achieved a Healthy Silver Award in their second year with SkyWell. 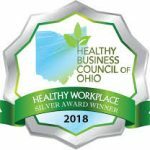 SkyWell program at HKM Direct Market Communications earns HBCO Bronze Award. Designed exclusively for each employer to fit your company’s priorities and budget. Health and safety workplace assessments. Cultural support and behavior change interventions. Health coaching online and/or on-site. Health risk assessment, biometric screenings and other programs. When well-being is a priority, employees feel good, are engaged, and energized in all aspects of life. Wellness promotion helps prevent chronic disease. Rewards and contest entices program participation. Healthier employees are happier, more productive, and use less sick time. 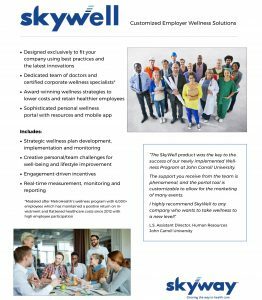 Click to download the SkyWell employer wellness solutions factsheet. “SkyWell was key to the success of the wellness program at John Carroll University. The support received from the team is phenomenal, and the portal is customizable to promote many events.